Shirts With Random Triangles: The Fallout: Jared Shanker, Illinois, Ohio St., and more. The Fallout: Jared Shanker, Illinois, Ohio St., and more. 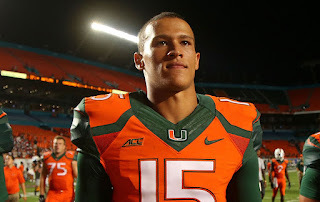 Brad Kaaya. Image via palmbeachpost.com. ESPN's Jared Shanker declares Miami starting quarterback Brad Kaaya to be the "ACC's 'best pure passer'." Off Tackle Empire's week-long look at Illinois looks at what it will take to keep out-of-state schools from poaching the best prospects from the Land of Lincoln. ESPN's Austin Ward looks at Ohio State's 2016 schedule, and picks the period between Week 7 and Week 10 as the toughest four-game stretch. The Buckeyes face Wisconsin, Penn State, Northwestern, and Nebraska in order between Oct. 15 and Nov. 5. Thanks for share a nice post. We are waiting for your next one. ESPN's Austin Ward takes a gander at Ohio State's 2016 timetable, and picks the period between Week 7 and Week 10 as the hardest four-amusement stretch. The Buckeyes face Wisconsin, Penn State, Northwestern, and Nebraska all together between Oct. 15 and Nov. 5. The story you shared about the trip is really necessary and useful!